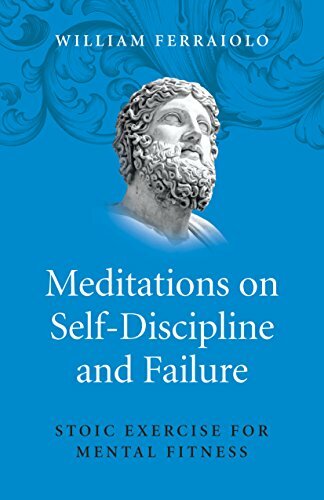 William Ferraiolo's Meditations on Self-Discipline and Failure is something like a general a self-help book for those seeking help to pull their life together, but it's not written in the typical style of a self-help book. It's written in the style of Marcus Aurelius' Meditations and is like it both in being a collection of assorted bits of advice and self-criticism and in being influenced by Ancient Stoicism. The book is written in the second person and includes advice interspersed with repeated censure of "you," the reader, denigrating your virtues, skills, and accomplishments and advising you to be more self-reliant, to take responsibility, be humble, and seek to better yourself. The criticizing tone is meant to emphasize that you are flawed, and the advice is meant to provoke self-improvement. Some of the other themes that reappear throughout include cultivating strength, being brave, being grateful, not complaining about your miseries, simplifying your life, having realistic expectations, striving for challenging goals, not playing the victim, and many more. At times, the advice is written as something to read after particular events happens, such as after you say something stupid, after a person close to you commits suicide, or after someone libels you. Since the book is Stoic in outlook, the relationship between Stoicism and Cognitive Behavioral Therapy (CBT) is worth noting. Other writers have described this relationship elsewhere, such as that one of the founders of CBT, Albert Ellis, was influenced by Ancient Stoic figures like Epictetus. So, it is quite interesting that, in this very Stoic book, there are many echoes of CBT. Ferraiolo is, for one, focused on promoting self-improvement through changing one's thought process, and he even at times recommends recording your thoughts, shortcomings, and activities. Also, many of the bad habits he criticizes do resemble the mental distortions that CBT focuses on avoiding, such as mind-reading, discounting positives, and blaming others (though Ferraiolo doesn't use those terms). It's not clear if the connection is intentional, and the book probably could've been improved by making the connection more explicit and even using a comprehensive list of mental distortions as an organizing principle. In fact, the main criticism of this book is that it's rather disorganized. In this it resembles Marcus Aurelius' Meditations, but whereas that was simply a set of notes Marcus Aurelius wrote for his own purposes and not intended for publication, this is written for readers and could benefit from structure, such as by organizing the chapters around particular themes. In the end, however, it's a very accessible book – it's quite short and the style is mostly of simple and clear. It's audience includes both people whose life may not be going so well and need a good kick in the pants to get their life sorted, as well as people who are doing pretty well but might need some encouragement to keep working for improvement. In that way, it can serve as good inspiration for anyone struggling to progress down the hard road of self-improvement.